Adult female, Mendocino County Adult female, crossing a trail in late May, San Mateo County. 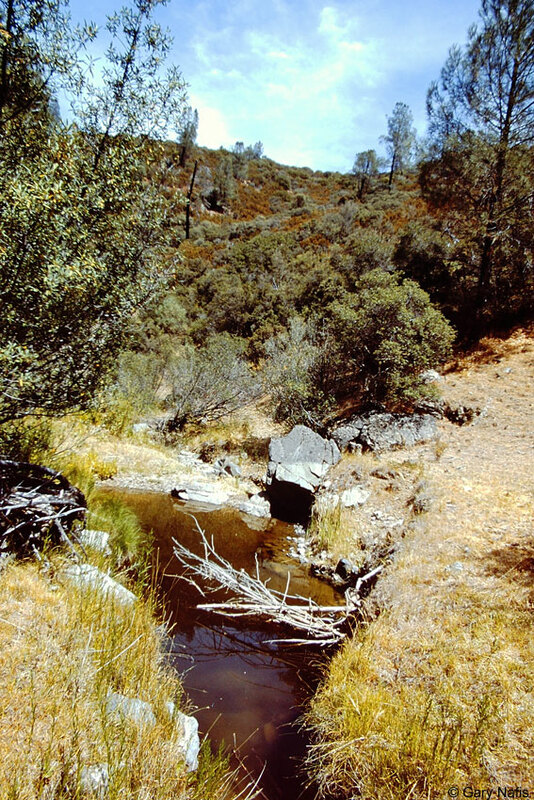 This Santa Clara County turtle travelled away from a dry creek in summer to bury itself in an upland location above the creek in oak woodland habitat. It will stay there until the following Spring when it returns to the creek. The turtle was found by tracking the transmitter which you can see attached to its shell. 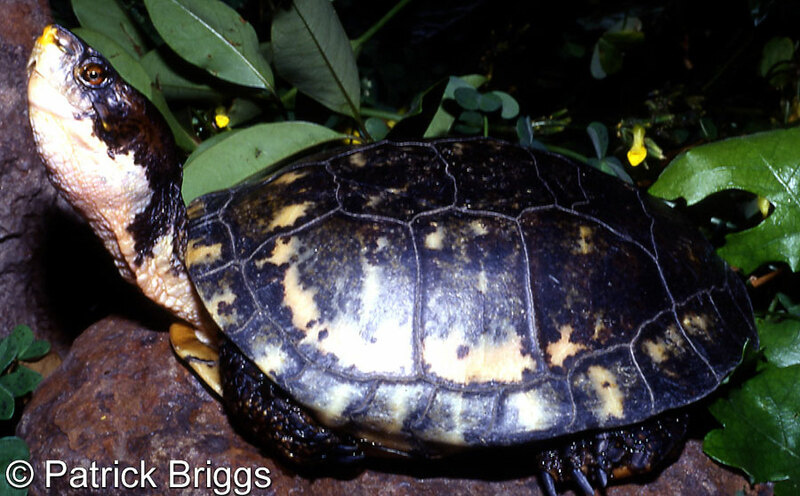 Introduced melanistic sliders and old sliders whose red "ears" have faded, are often difficult to distinguish from the California native Pacific Pond Turtle, especially at a distance in the field, and even in hand. 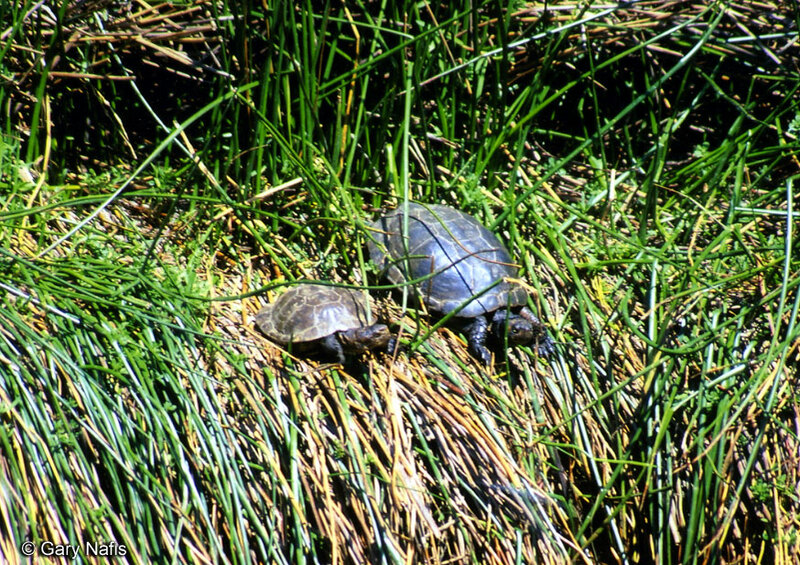 According to Bob Packard, with the Western Riverside County MSHCP Biological Monitoring Program, his organization confirms the identification of these turtles based on the presence of large inguinal and axillary scutes on the sliders, which are absent on the pond turtles, and by an interesting behavioral clue: the majority of sliders tend to be aggressive, biting readily, while pond turtles are far more reluctant to bite. Adult, Juvenile, and Egg, Butte County. Adult basking on branches in pond, Contra Costa County. 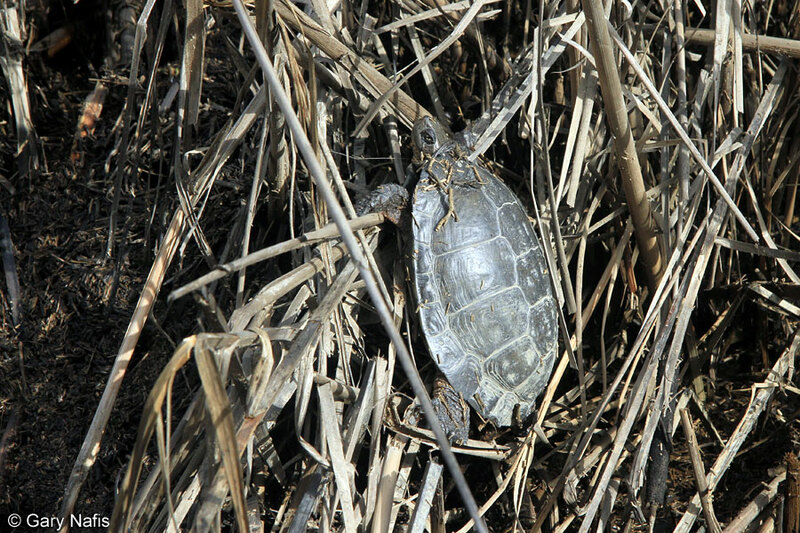 Where no objects are available in the water for basking, pond turtles will use branches overhanging the water, or they will bask on the shore. 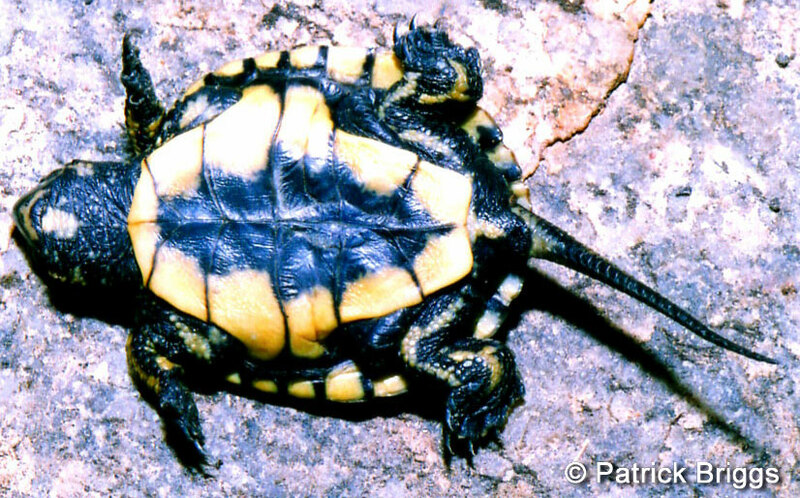 Turtles south of the Transverse Ranges tend to be lighter, from yellowish brown to light brown. Seldom basks by floating at the surface. Active from around February to November. 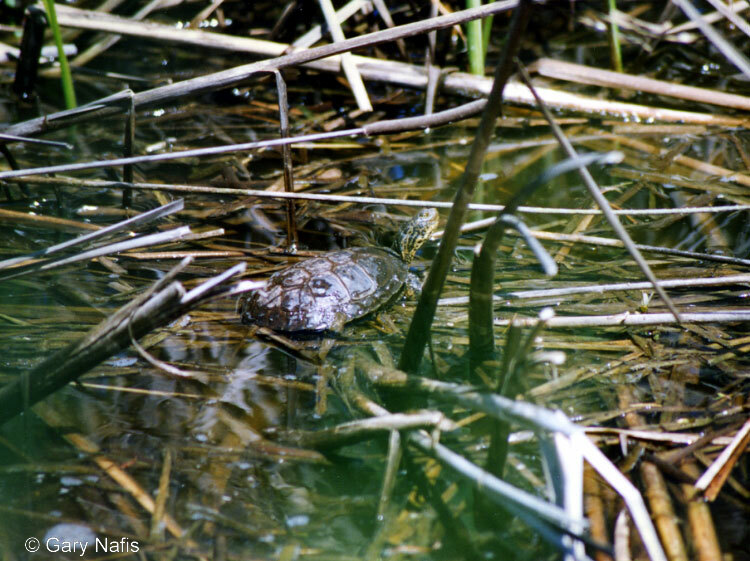 Western Pond turtles hibernate underwater during several months in the winter. They cluster in the shallow end of the pond. 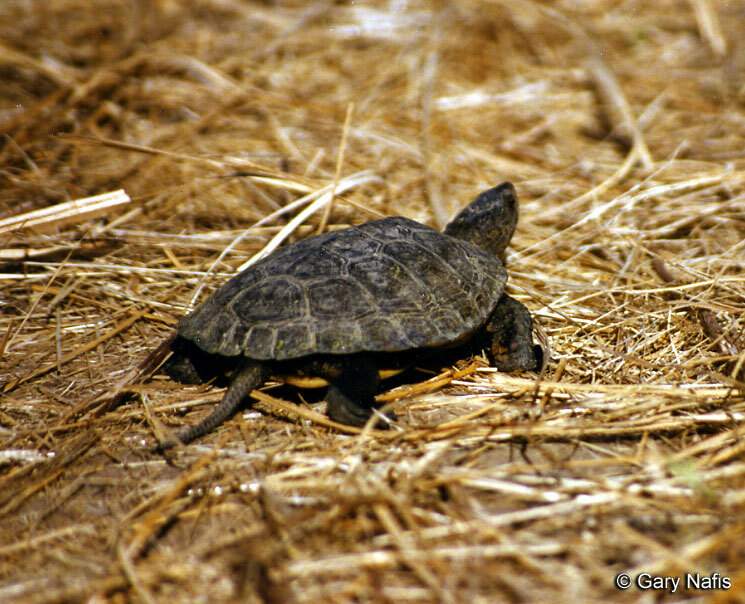 A pond turtle will estivate during summer droughts by burying itself in soft bottom mud. 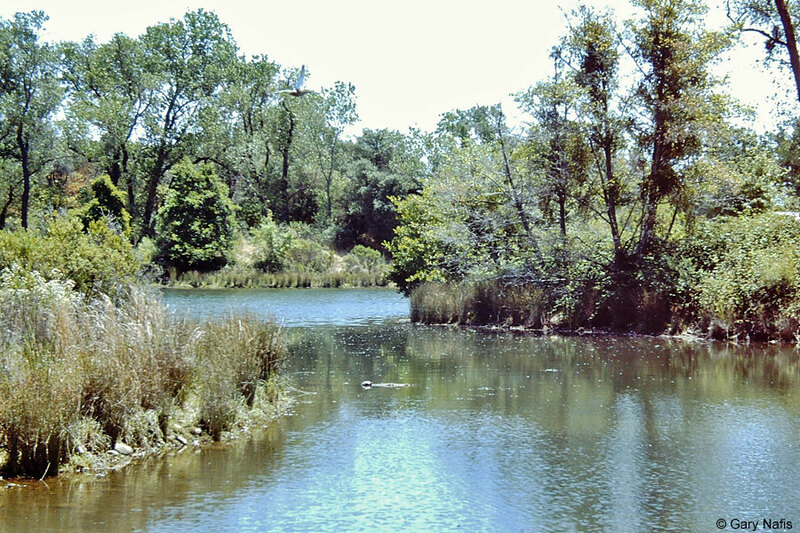 When creeks and ponds dry up in summer, some turtles that inhabit creeks will travel along the creek until they find an isolated deep pool, others stay within moist mats of algae in shallow pools while many turtles move to woodlands above the creek or pond and bury themselves in loose soil where they will overwinter until temperatures warm up enough for them to become active and the heavy winter flows of the creek subside, and then they return to the creek in Spring. 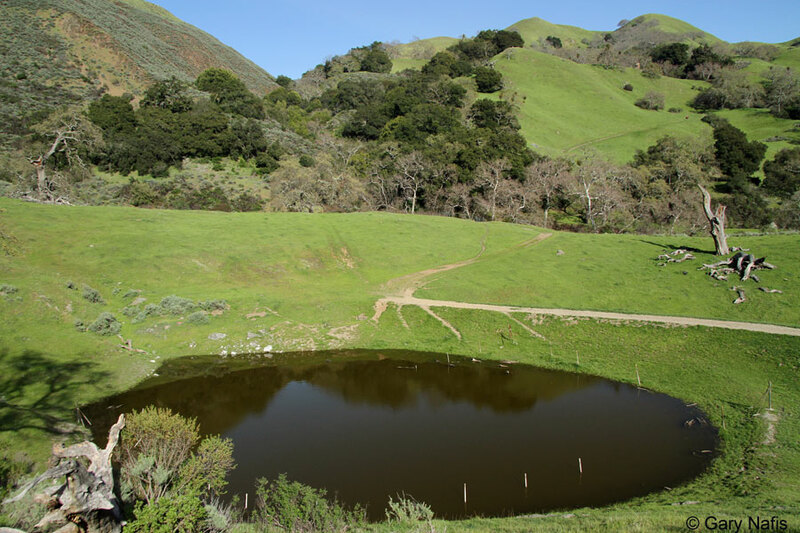 It is not clear what species of Western Pond turtle occurs immediately south, east, and west of the San Francisco Bay since no specimens from that area were used in the study which described the two species. There is no mention of hybrids occurring in this area. 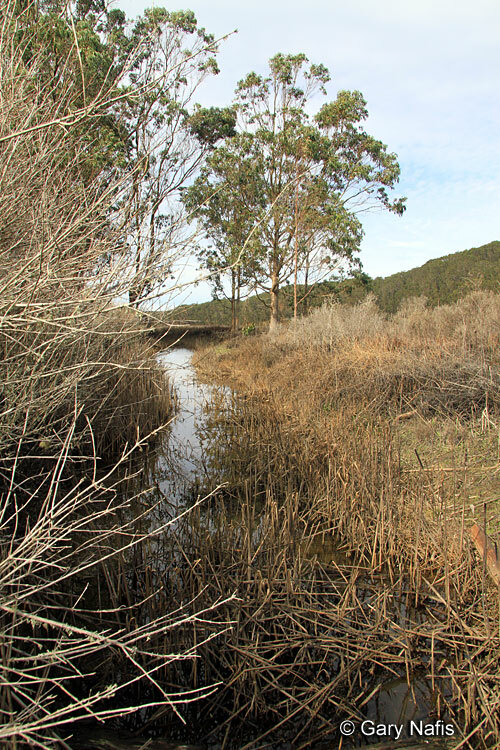 ("Emys marmorata and E. pallida show very limited intergradation in a few populations in the northern central coast range and adjacent Sierra Nevada foothills, although at all intergrade sites we also found pure individuals of the locally prevalent species.") Based on the range description of A. pallida cited above, I have shown a zone south, west, and east of the S.F. 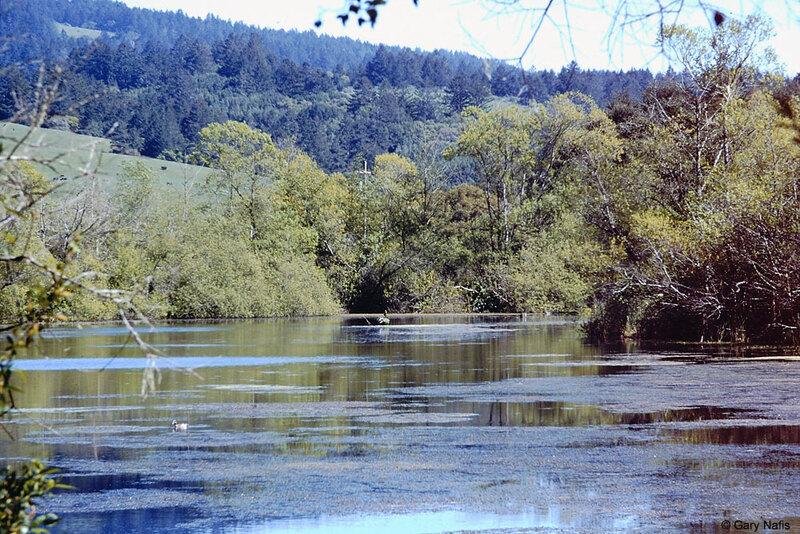 Bay on my range map where the pond turtle species is not known but which I will group with A. marmorata until I learn otherwise. 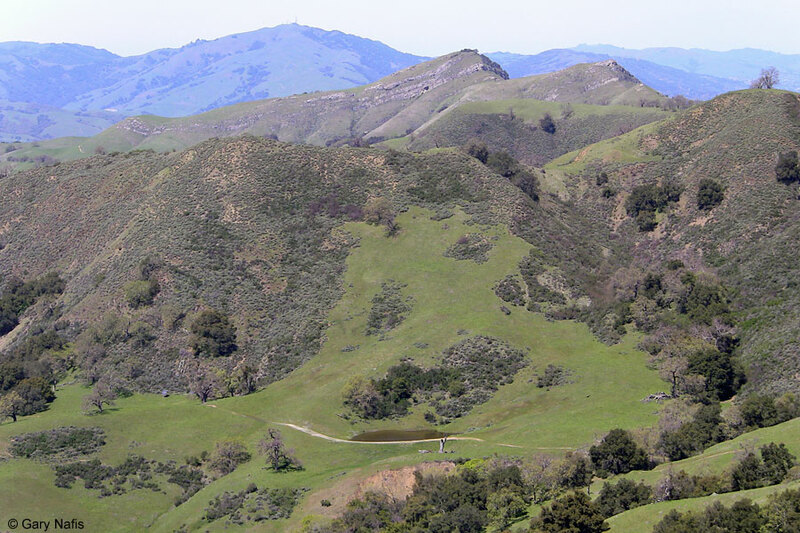 There is another zone in the southern Tehachapi Mountains which is also not represented by samples in the recent study, so the contact area between the two species there is also not known, but which I will also group with A. marmorata for now. A. marmorata ranges north of California into Oregon, Washington and British Columbia (west of the crest of the Cascades and Sierras) (It may now be extinct in western Washington and British Columbia.) An isolated population occurs at Susanville. Another isolated population occurs in Nevada in the Truckee, Carson, and East Walker Rivers (Stebbins 2003). * Phillip Q. Spinks, Robert C. Thomson, and H. Bradley Shaffer. 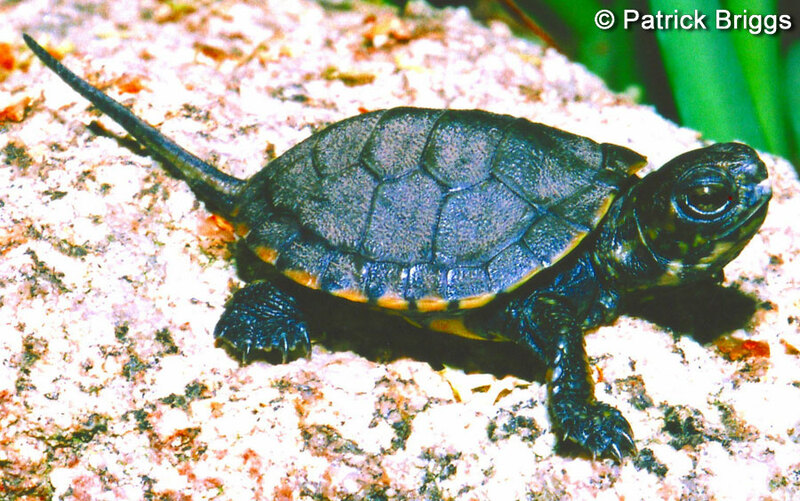 Northwestern Pond Turtles may be nearly extinct in western Washington and British Columbia.